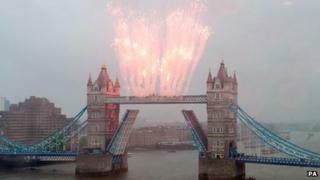 Fireworks scratched colours into the slate grey sky after being unleashed from the top of Tower Bridge as the historic royal flotilla finished gliding along the Thames. This signalled the end of the Diamond Jubilee pageant in London, but other events did not survive in the wet weather - namely the cannons primed to explode confetti and a helicopter flypast, which was cancelled because of visibility. The fine, yet unrelenting, rain did not show mercy either to the soaked singers who gamely sang the national anthem in the closing stages. These events were the dying embers of a day that had seen fun, food, celebrations, dressing up and several renditions of the national anthem, as well as a protest against the monarchy - all stubbornly carried out despite the rain. At the start of the day, some revellers heading to the capital had their plans disrupted by overcrowding on the train network, with reports of passengers left behind on platforms because carriages were full. Others stayed at home to celebrate, with almost 9,500 roads shut across England and Wales for parties. Those in the capital threw themselves into the celebrations, none more so than those who attended the Big Jubilee Lunch in Piccadilly, made up of a long line of tables in this usually traffic-choked street. Wandering down Piccadilly, resplendent in their tiaras and red, white and blue outfits, were three friends - Jodie Merrylees, 27, from Cheltenham, Gloucestershire, Charlotte Symonds, 30, from Brighouse, West Yorkshire, and Jodie Cosgrove, 27, from Leeds. Ms Symonds said: "I really like the Royal Family and the tradition it represents. I was at the royal wedding too and that was brilliant. We wanted to dress up for the Jubilee and get involved with the atmosphere to feel part of the celebrations." It became an even more grand event when the Duke and Duchess of Cornwall arrived, walking down the line of tables and even stopping to sit down on a potentially soggy seat to chat to some of those munching their food. Street parties were definitely popular on the day, particularly in Bristol, which had more applications for road closures than in other city outside London. Revellers there gathered in a red, white and blue-bedecked Millennium Square, which boasted its own "make your own corgi" attraction. Inspired by the Thames pageant, Andrew Southerden, a landlord in Kibworth, Leicestershire, transformed his pub into HMS Coach & Horses, affixing portholes, liferafts, funnels and a bow to the building. Party-goers in Richmond Park, Gainsborough, Lincolnshire, were able to snap up food at 1950s prices. Hot dogs were 7p, bacon sandwiches 9p and a cup of tea just 2p. In Belfast, Samuel and Margaret Sloan, 80, were celebrating their 60th wedding anniversary as well as the Jubilee at a tea party thrown by the city's Lord Mayor. "It is a great honour," said Mr Sloan, a retired motor mechanic. "She is a very gracious Queen and she does care for the people." More than 300 official street parties took place across Wales. Cardiff's St Mary's Street hosted a Big Lunch celebration while hundreds attended a similar event in Swansea. A beach party was rained off in Rhosneigr, close to the Anglesey home of the Duke and Duchess of Cambridge, but the party went ahead regardless - a picnic was held in the village hall instead, attended by hundreds of people. Ten street parties took place in Edinburgh, with the Scottish capital understood to have made a third of all of Scotland's street party applications. But not everyone taking part supported the royal family's constitutional role. Abigail Burnyeat, who attended a street party in Edinburgh's Stockbridge, told the BBC she enjoyed herself but did not see the event as an endorsement of the monarchy. "It's a celebration of community," she said, adding: "I wouldn't examine it too closely." As the Diamond Jubilee pageant began, its 1,000 vessels were greeted along the route by 1.2 million spectators, according to the organisers. Crowds lined the banks of the Thames, some climbing up onto window ledges of nearby buildings to try to get a better view, all thankful that by now the skies were holding onto their raindrops. On Lambeth Bridge, a carefully controlled number of the public were allowed on, each choosing a side to stand on, to either watch the pageant arrive or see it pass off into the distance. As it approached, the smaller boats before the bigger ones, great cheers rose up, as did the crackling of plastic flags. That sound reached a crescendo when the royal barge approached, prompting many hands to raise mobile phones and cameras, like electronic meerkats desperate for a view. Among those on the bridge was Marilyn Griffiths, 59, from Ledbury, Herefordshire, decked out in a union jack hat, earrings and carrying a flag. She described the pageant as "spectacular", adding: "I just love the Royal Family and admire them all for what they do. They all work so hard. I wanted to come here to show my support." By the end of the pageant the rain had become almost torrential, with everyone wet through. And yet the good humour of the crowd survived, with one man even enjoying a rather soggy ice cream. The last of the steam boats sailed by sounding their horns together and drawing cheers from the flag-wavers along Tower Bridge. "I saw the Queen," shouted one small child to his mother. It was certainly an achievement for all.